Frederick Frank is president of Dr. Konstantin Frank Wine Cellars, a position he has held since 1993. 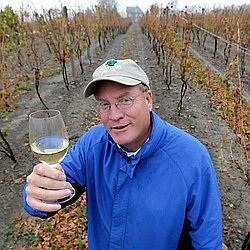 After graduating from Cornell University, Fred worked for Banfi Vintners in sales from 1979 to 1982, before attending Geisenheim Research Institute for Viticulture and Enology in West Germany in 1982-1983. He was managing director of Old Brookville Vineyard at Banfi from 1984 to 1993. Under Fred’s leadership, the winery’s production and number of honors received has increased greatly, with Dr. Frank’s Riesling poured on numerous occasions in the White House. Wines from Dr. Frank’s winery are now available in over 30 states, making them among the most visible and well-known produced in New York State. The winery draws 70,000 visitors each year, providing a considerable boost for the local economy. Fred, the winery, and its wines have been featured in such publications as the Wall Street Journal, Rochester Democrat and Chronicle, Wine & Spirits Magazine, New York Times, The Washington Post, Wine Enthusiast and more. Daughter Meaghan Frank recently joined the winery as General Manager. Fred is enjoying his time working together with Meaghan to continue to the winery’s vision of excellence. Please join Fred Frank on this voyage up the Rhine River, visiting Amsterdam, Cologne, Rhine Gorge, Heidelberg, Rudesheim, Strasbourg and Basel. Please note: The 2019 Captivating Rhine River Cruise and post-cruise Switzerland tour is created solely for Dr. Konstantin Frank by ToursandWine.com (by Expanding Horizons of Tustin, California), our tour operator, and in conjunction with AmaWaterways.